While it's not exactly a free font, Shruti true-type font can be just the thing - assuming you're trying to write to someone fluent in Indian dialects. Not intended as a free font, Shruti was created exclusively for Microsoft by Raghunath Joshi (the Type Director) and Santosh Kshirsagar. 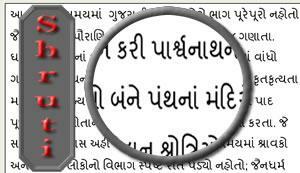 Now in it's fifth version (it was created in 2006) it is used for the Indic script "Gujarati." However, if you go to the font website at Microsoft on a Mac, while you'll be able to see the images of the font, you won't actually be able to "try" the font out. While it was originally designed as a user-interface font, the type is in TrueType format, including a bolded version and outlines. This means that you can use it for things like brochures, and also you can license it for embedding in websites and applications. Originally the font was not available for Macs, and this caused a lot of difficulty especially in academic circles, where people in India were trying to send papers and more to Western Macintosh users (Macs are commonly used in educational circles). However, it is now available from the AscenderFonts website for either PC or Mac at the low price of $99. Since it wasn't designed to be a free font, Shruti-type fonts obtained from other websites have to be a bit suspect. Many sites will offer the font and others such as Helvetica, but many of them are scams. For example, one called "u-fonts" shows the "free font Shruti" almost identically as portrayed on the MicroSoft page. There are examples, information, and even another "try-before-you-buy" window (though this is supposedly just "try-before-you-download"). There is even a security box where you have to type in a number image to prove that you are really a person before clicking the download link. However, when you do click on that link, suddenly an obnoxious "find free businesses in your area" type of page comes up, covered with ads and even some automatically playing videos that blare loudly from your computer. It's an example of the worst type of spam. It's probably better to simply fork over the money for the authentic version of the font and avoid any malware or viruses that might be hiding in other "free" websites. Once you have the font downloaded, you do still have to actually install it on your machine before you can use it in any applications. The process is much simpler than it used to be - in fact, on a Mac you can simply double-click on the font and open the "Font Book" app, which will let you see the font, control who uses it and with which applications. If the applications are open when you install the font, you will probably have to re-start them before Shruti is actually available for you to use. On a Windows machine, the process is slightly different. Aside from actual correspondence, the Shruti font can also be used for decoration on any Indian-themed document, like a poster. With the growing number of Internet users from India, as well as the popularity of Indian culture as it spreads throughout the world, even as a not-free font Shruti is a valuable asset to any writer or designer.